Luke was out-of-town this past weekend and when he goes out-of-town it is my chance to make all the food that he hates and refuses to eat. One of the foods that he hates are mushrooms. He has a total and complete aversion to mushrooms for some reason. But I love them. 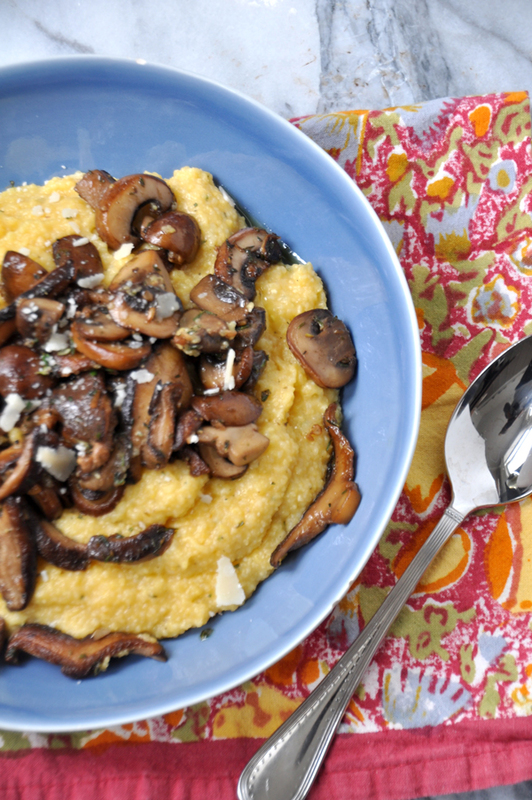 So while he was out of the house, I made a big pot of herbed mushrooms over some creamy polenta. We live pretty close to the Ferry Building here in SF which has an amazing farmer's market, as well as really cool culinary stores inside of it. One of these stores is Far West Fungi, a store that only sells mushrooms and mushroom products. (They even sell a grow your own mushroom kit!) I stopped in for some fresh mushrooms. I was hoping for some chanterelles but sadly those are out of season so I grabbed some criminis and shiitakes and headed home. One of the things that I love about this dish is that is meat-free but leaves you feeling satisfied like you have eaten meat. It is hearty and healthy. The recipe also forces you to open a bottle of white wine that unless you want it to go to waste, you should drink. So make sure it is nice wine - wine that you would enjoy cooking with but most importantly drinking. 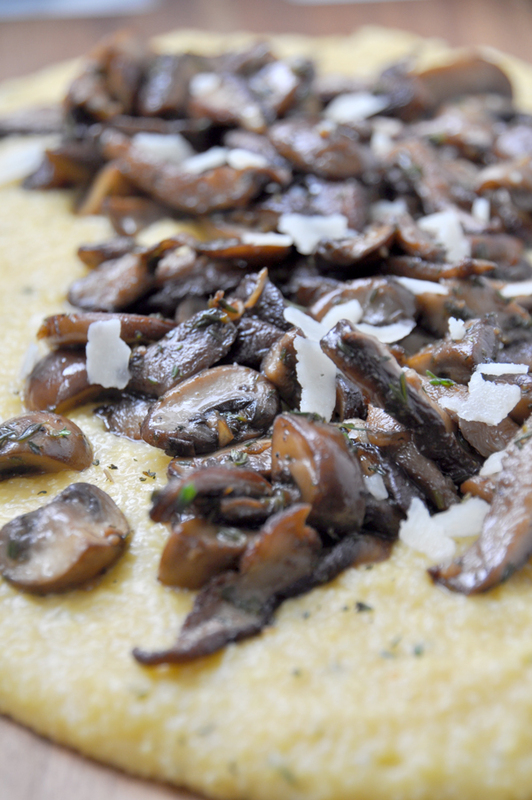 Also, herbed mushrooms and polenta is gluten-free. This whole gluten-free thing is a cinch! This dish is vegetarian and could even vegan if you leave out the butter. I am not ready to go that far but it is an option. One of the best parts to this dish is that it is simple to make. Everyone thinks polenta is high maintenance because you have to constantly stir it. Polenta is best left on the stove over a very very low flame. Stir it every once in a while so it doesn't stick to the bottom and after about an hour or so you will have creamy dreamy polenta. 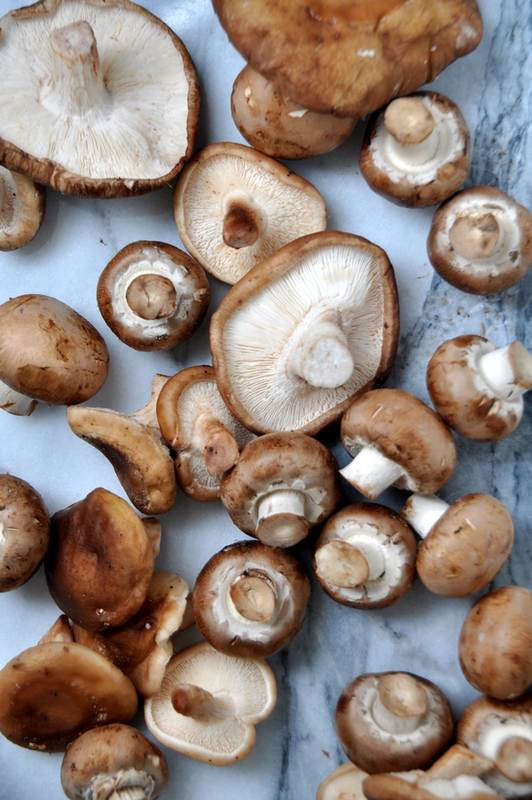 So Saturday night consisted of a big bowl of delicious herbed mushrooms and polenta, some white wine, a good old-fashioned teen novel that I can't seem to put down and the couch. It was the perfect Saturday night. I am pretty sure I was in bed at 10.